So far for me it it was so easy to right click in Eclipse IDE and create executable .jar file with few simple clicks. Last week I had to create executable .jar file manually on my Digital Ocean node on which we hosts usually lots of services. It took some time to create .jar file directly using only commands but finally after 10 minutes, executable .jar file was ready. How do I make a jar file executable in Linux? How do I compile a jar file in Linux? How to make a JAR file Linux executable? How to Create and Execute a .Jar File in Linux Terminal? If Java is already installed then go to step-4 directly. Try running command javac and if you see below result then there isn’t any Java install on host. 0 upgraded, 1 newly installed, 0 to remove and 92 not upgraded. Need to get 217 MB of archives. After this operation, 228 MB of additional disk space will be used. Selecting previously unselected package openjdk-11-jdk-headless:amd64. Just try running below commands again and you should see installed java details. 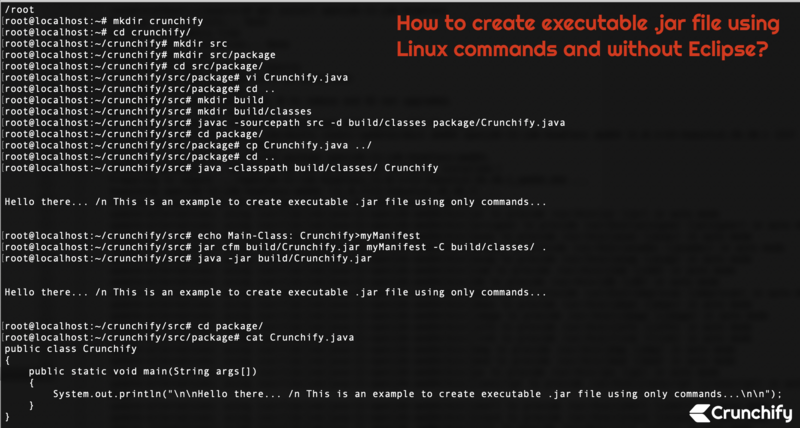 Here are the list of commands you need to execute in order to create executable .jar files. root@localhost:~/crunchify/src# jar cfm build/Crunchify.jar myManifest -C build/classes/ . drwxr-xr-x 4 root root 4096 Mar 31 00:52 ..
drwxr-xr-x 3 root root 4096 Mar 31 00:52 . As you see above, you have Crunchify.jar file created under /root/crunchify/src/build folder. How to change Default Java /JDK Version and ClassPath in Linux using .bash_profile? Ansible: How to Execute Commands on remote Hosts and get command result (log) back? Use “maven-shade-plugin” to Create just 1 Executable jar with all required Dependencies in it for your Java or Spring Project?